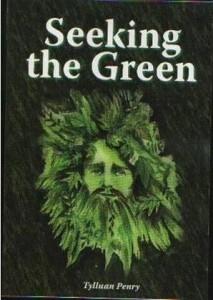 Tylluan Penry’s first book, Seeking the Green, was published by Capall Bann (www.capallbann.co.uk) in 2008. It was the product of many years of seeking her path, and Tyllan wanted to be able to pass on to others what she had learned instead of having to start from the very beginning as she had done. Don’t forget that all books can be autographed and/or inscribed by Tylluan! Please let me know at the checkout what you would like written inside the book for you or the intended recipient! I never seem to do things as others might do them and reading and reviewing Tylluan’s books is no exception. I read Tylluan’s last book first and have now read her first book last. This book is a wonderful gentle introduction to the craft, the old ways. It is a reconnection to the green of the earth we stand on and walk every day. As someone who has followed a solitary pagan path all of my life there were large parts of this book that were not new to me, but they were lovely affirmations that I wasn’t alone or bonkers. That when I stop and watch and listen to the robin singing as he sits on the side of a skip, and I marvel at his tenacity to rise above the dirt and noise of the building site or that I stop and look in awe at the violets that are growing out of the side of a drain cover, that I am not the only one that notices these things and that they matter and that the messages within the song or spectacle are there to be learned, if we can just stand still and quiet in and with the green for one magical moment. What I do love about this book is that at every new idea it gives, it asks that you stop and think what this might mean to you, what might be the consequences for you if you do this, how does this fit with your beliefs. I think that unlike a lot of “beginner books” (sorry, that really is a horrible expression and this book is much more than that, but I couldn’t think how else to express this) Tylluan never says this is what you must do and you need to follow this the way I do it, she never really lays down hard and fast rules, this book gives you the idea, the concept, the ritual even and then asks that you make this your own, that you shape and challenge your own ideas thoughts and concepts. This book is full of song, full of messages, full of affirmations; I loved it like I love an old friend. I have also noticed that Tylluan is a very clever author, having read this I now feel the need to learn more about what grows in the little wild places, in the secret corners. I shall now have to buy “The Magical Properties of Plants and How to Find Them” By Tylluan Penry. This is a good book for any neophyte who feels drawn to the natural side of the craft. Penry gently draws the reader into the Green Path, giving some introductory lessons in the basics such as ground and visualisation and teaching about the more natural aspects of the craft including some interesting discussion about magical gateways. The book follows on with some more direct teaching on spell-crafty, protection and the like, giving the reader a full set of tools to start them on their way to seek the Green for themselves. Penry has written an article on solitary witchcraft for this issue of the magazine if you would like a taste before investing in this excellent little book.